Founded in late 2013 by two brothers and a sister, Falling From Trees are an acoustic four-piece currently based in Norwich, UK. The band have gained widespread acclaim for their lively performances and eclectic sound, fusing folk and blues influences with soulful lead vocals and effortless harmonies. 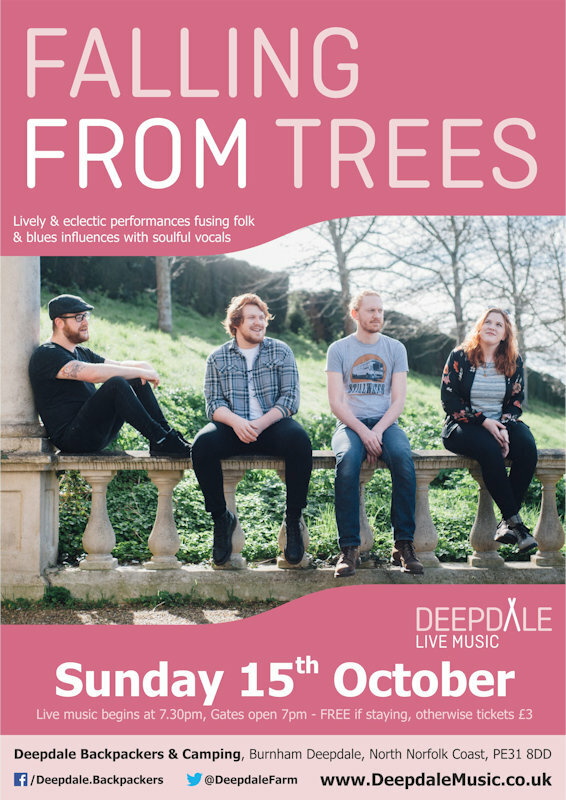 In 2015, Falling From Trees released their first studio recording, "On and On" (EP), earning significant air play and a track of the week pick for "Distant Little Stars" on BBC Introducing in Norfolk. This was followed by "Words" (EP) in 2016, which further solidified the band�s sound and saw widespread recognition, including a glowing review from FATEA Magazine who described the title track as a "folk anthem". Outside of the studio, Falling From Trees are prolific in the Norwich and Norfolk music scene, performing at every opportunity; a passion that has translated in to a myriad of opportunities, including sharing a stage with Mark Flanagan of Jools Holland�s Rhythm and Blues Orchestra at the Southwold Arts Festival and performing on the BBC Voices stage at the Lord Mayor�s Celebration in Norwich. Falling From Trees - Sunday Session - The live music programme at Deepdale Backpackers & Camping continues with a Sunday Session by the wonderful folk & blues fusion that is Falling From Trees.